Imagine a well done face of makeup, everything applied perfectly...the base, the eye makeup, fluttery long falsies...but no color on the face. Even a well done base and eye makeup can look unfinished without that hint of color on the cheeks and a glow on the cheekbones. This is why wearing a blush is such an important step in looking like you are radiating with health and wearing a highlighter is like the icing on the cake. Oriflame recently launched its The ONE IlluSkin Collection which also includes 3 very flattering blush shades, for Indian skintones particularly ,which have a complementing highlighter shade beside them as well. 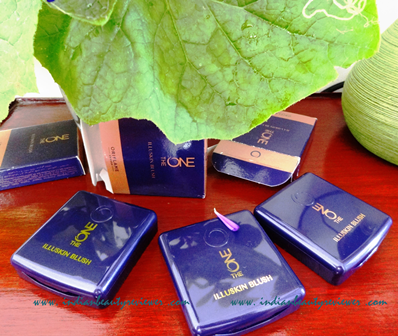 Oriflame The ONE IlluSkin Blushes are packaged in a shiny bright purple plastic case which comes in a purple carton as well. 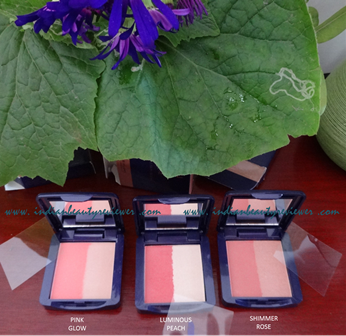 The blushes are really compact in size and can fit into the smallest of purses. The lid closes with a slight sound and the lock in front is very secure. No need to worry about the lid opening inside the bag. The lid has a mirror attached inside which come in very handy for on-the-go touchups. I do feel that if a small and flat blush brush was included inside the packaging, possibly in a separate tray, it would have made re-application of the blush a bit more convenient. 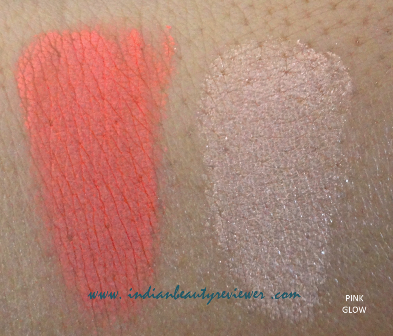 Price and Quantity : 599 INR /- for 4 g.
Oriflame The ONE IlluSkin Blushes have decent pigmentation. The initial application is light to medium in intensity but the the product can be built up to achieve a bright flushed look on the cheeks. The blushes are very finely milled and feel supersoft on the fingers. 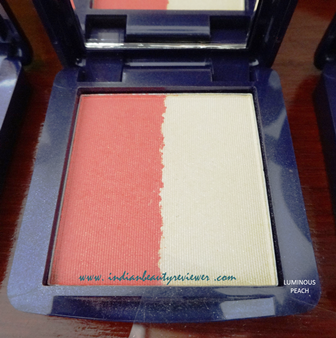 The blushes blend very easily and the finish on the cheeks comes out even and very satiny smooth. All the 3 shades are designed such that they make the cheeks appear naturally flushed. Each blush shade comes with a matching/complementing highlighter shade along with it . But I did feel that the highlighters did not have a very smooth texture, rather they seemed a bit gritty to touch and not as finely milled as its blush counterpart. the color payoff is quite good though. They are also quite blendable and buildable like the blushes. The staying power of the blush-highlighter duo combos on my skin was around 5 to 6 hours. Oriflame The ONE IlluSkin Blush in PINK GLOW is a beautiful corally pink blush which is totally matte but again very soft and smooth in texture. The highlighter shade is a light beige to pinky color which seems slightly shimmery too. This shade will mostly suit fair skin tones and probably will be a bit difficult to make it show up on darker skin tones. Pigmentation is decent and a few swipes will make the color look quite natural on the cheeks, but building up is required for a darker effect. 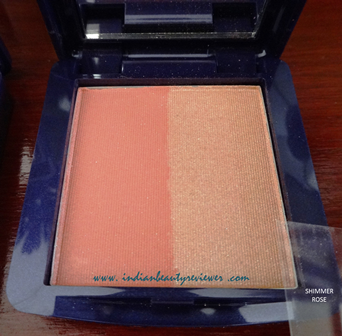 Oriflame The ONE IlluSkin Blush in LUMINOUS PEACH is more rosy than peach, atleast in the pan. 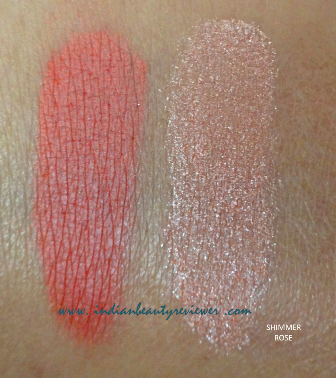 On swatching it, it was somewhat of a darker peach shade that can be counted as a rosy-peach blush. This warm blush would look great on wheatish skin tones. The highlighter is very silvery with chunks of silver shimmer it. The color pay off of both the blush and the highlighter is quite good and they stayd on my skin for a good 6 to 7 hours. Oriflame The ONE IlluSkin Blush in SHIMMER ROSE . The name says it all. This is a beautiful rose colored blush which has a beautiful satin finish and a velvetty smooth texture. 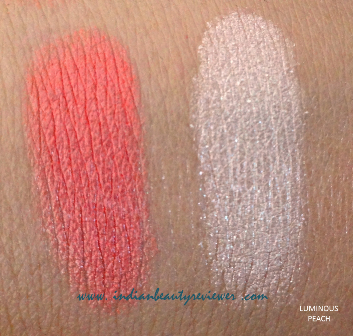 Blendability is also good and the pigmentation is great. 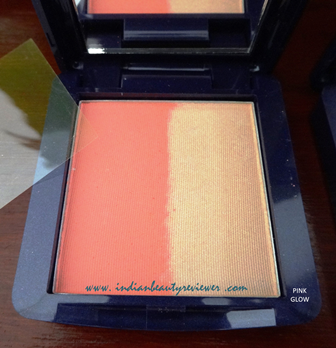 This blush would really flatter darker skin tones. The highlighter that comes with it is quite chunky glittery and not so smooth in texture although it is of quite a unique shade. The highlighter is of a very light bronzy-rose color and matches the blush shade very well. The color pay off is good and the lasting power is 6 to7 hours. Will I purchase this product again : Yes ...Totally! I love the gorgeous blush shades...They look so natural on the skin, are really really smooth and easy to blend, take up very less space in my bag and come with the added advantage of a matching highlighter shade. Though I would purchase it more for the blush colors than the highlighters ! I have the same color and I love this blush! As you pointed out, the blush and highlight portions are really useful. Gumtoo: Tattoos designed for having fun!